We did a little spring cleaning on our website over the Easter Holiday. There are some exciting new features and improved experiences that we would like to show you. Follow this guide to make the most out of our newly revamped Water Transfer Printing website. First things first, we moved things around to make it more organized and provide a better user experience. This means that old pages like our Film Gallery and Product page now have a different URL. If you are linking to any of our pages from your website please update them with these new URLs. If you do not update these links they will result in a 404 error and create a bad experience for your customers. Our new website utilizes 2048-bit SSL Encryption on every single page. This ensures that your information is safe. Our new website structure has been designed to make it easy to find what you’re looking for. Within these categories, films are further segmented into Tags. Tags can be found just under the product excerpt on every single product page (as shown above). They are organized primarily by camouflage brand and film aesthetic. This way if you see a camo brand you like or a specific type of wood like Burl Wood, you can easily click on the tag and see all the films that meet that criteria. Our Sitemap contains all our film categories and tags. Our wood grain Water Transfer Printing films have been carefully reviewed and organized to make your search for a beautiful wood grain fast and simple. Like a specific Water Transfer Printing film and want to see more like it? We have built suggestions into every film product page so you can easily find similar/complimentary patterns. Our homepage has been reimagined to provide a quick and easy way to get the information you are looking for. 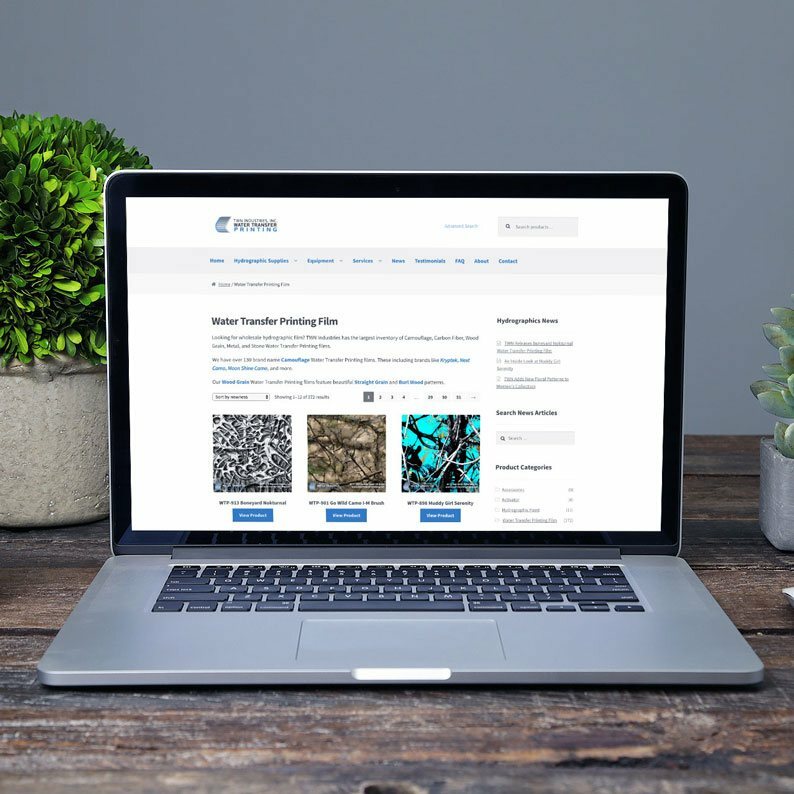 Easily download our TWN Gallery App, learn more about our Water Transfer Printing Training and Equipment offerings, and view our various branded camouflage Water Transfer Printing films. Basic Search can be found in two prominent places on our website. The upper right corner on desktop devices. Fixed to the bottom of the screen on mobile devices. Pro Tip: If you are searching for a specific film, just type in the 3 digit WTP number. For example, typing in “913” in the search bar will direct you to our new pattern, Boneyard Nokturnal. Keywords can also be used like “skulls”, “american flag”, “kuiu”, “walnut”, etc. We also have built an Advanced Product Search that suggests products based on your query. You can also choose to search in a specific category (as shown above). It is now easier than ever to Sign up for our Newsletter. Our newsletter subscribers are the first to be notified of new Water Transfer Printing films, products, and Press Releases. Give us a like on social media and subscribe to our YouTube channel. Our Pattern Download can be found in the footer under the “Company” section. Log in with the password provided by our sales staff. You will be taken to a page where you can download just one or all our Water Transfer Printing films and our Activator Spreadsheet. We redesigned this experience so you can easily update your website as we release new patterns. Our website uses cutting edge mobile technology to load fast while you’re on the go. A footer bar will appear while browsing our site on your mobile device. Visit our Frequently Asked Questions, search for products, or give us a call in one simple click. If you wish to look at a full outline of our website you can visit our Sitemap. This page is a full directory of links to the main pages on our website including product categories, product tags, and news articles. Important Note: Due to security reasons, we have blocked requests submitted through <iframe></iframe>. If you are using this method to embed our film gallery into your website it will no longer work and will show up blank. Feel free to link to our Film Gallery directly using a normal link. We hope you enjoy our new Water Transfer Printing website. This remodel is an effort to better the user experience for our processors and their customers. We will continue to release new innovative features to the website. If you have any suggestions, find a bug, or wish to give us some feedback you can email us at info@watertransferprinting.com. Your friends at TWN Industries, Inc.